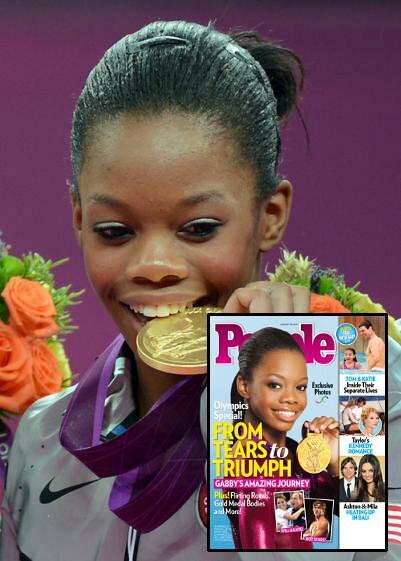 As the 2012 London Olympics near a close, gold medal gymnast Gabby Douglas has become a household name. She took home the gold medal in the Women’s All Around competition, which is easily one of the most prestigious events in the sport of gymnastics. Gabby, with her signature smile that has seemed to both captivate and inspire the world, graces the current issue of People Magazine. The magazine’s headline reads “From Tears to Triumph: Gabby’s Amazing Journey.” Gabby’s journey was definitely an emotional one, but when you’ve just been deemed the world’s best all around gymnast, well, that’s something to get emotional about. Ashton Kutcher and Mila Kunis in Bali is another hot story that is, of course, cover worthy. Ashton and Mila’s relationship seems to be heating up in all sorts of directions and, with pictures recently released of them getting all hot and heavy in the Bali airport, people are getting excited about this potential new Hollywood couple. There was some major hand holdage going on. And y’all know what hand holding in Hollywood leads to . . . babies. In fact, Ashton Kutcher wants to get Mila Kunis pregnant! Other stories featured in this special Olympics issue include some hot topics: Prince William and Kate Middleton flirt at the London games; exclusive photos from the event; and a list, with photos of course, of some of the world’s hottest athletes. Tom Cruise and Suri also managed to score some lines in the special issue, as did Taylor Swift and her new boyfriend Conor Kennedy. Birth Announcement: Kate Middleton And Prince William Plan For A New Year’s Baby!